Special paste to show transparent oil liquids level in the tanks. Light pink mellow LEVEL PASTE is durable and easily spreadable on sticks, poles or tapes. Spread the paste on the sticks (or poles) so that It covers the product level. Dip the stick (or the pole) in the liquid up to the end of the tank. 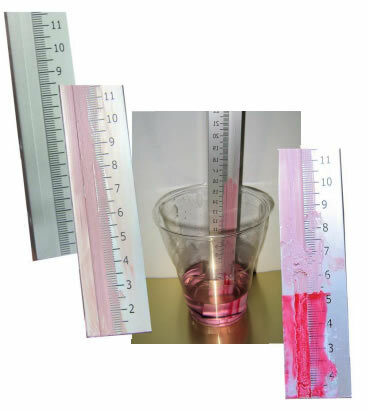 Pull the stick (or the pole) out from the tank; the liquid level is revealed by the different colour of the paste (from light pink to red purple). The paste is not subjected to alterations in contact with air, but It is appropriate to close the jar after the use. Furthermore the product should be stored in a cool and dry place, sheltered from heat and sunlight. To prevent the freezing, It is appropriate to stock the paste not below 8°C temperature.